As the cooler months set in and entertaining moves from the outdoors in, homeowners’ attention inevitably turns to preparing their interiors for more frequent use. 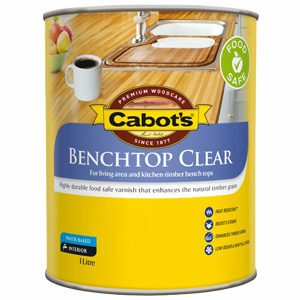 With this in mind, leading wood care products manufacturer, Cabot’s, has launched its new Benchtop Clear timber coating product for interior benchtops and tables. Highly durable, Cabot’s Benchtop Clear is the ideal instrument for protecting kitchen and living spaces against the spills of entertaining. Its heat and stain resistant properties ensure there is no long-lasting damage to benchtops from red wine splashes, food splatters, coff ee cup marks or any other damage from day to day use. One of Benchtop Clear’s key benefi ts is its food safe properties, which keep timber surfaces protected from nasty liquids such as oil, while providing a more hygienic food preparation area. Alongside its protective qualities, Benchtop Clear also enhances the natural grain of timber to prolong a quality look, with no risk of the coating turning yellow over time.